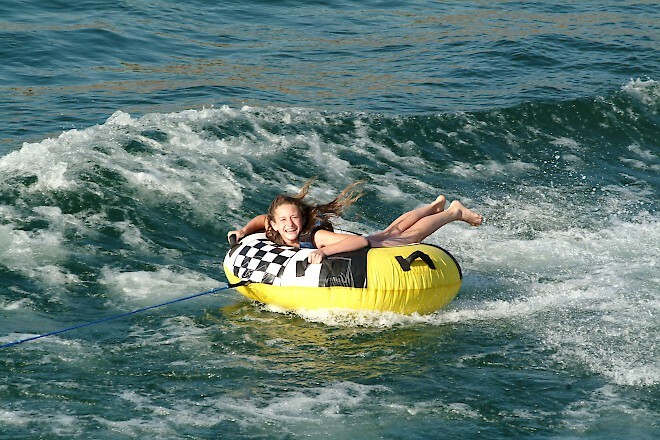 Amplify your fun with one of our water toy rentals! Hydro tubes, knee boards, skis, wakeboards, kayaks and stand up paddle boards are available for your convenience! * Includes vest, rope, flag. Patio and Party Boats full day rentals are from 9:45 am through 8:00 am the following day, or you may return the same day prior to 1/2 hour before the marina closes (hours vary based on season). Wakeboard, PWC's, Ski Boats, Fishing Boats and other small watercraft are permitted overnight only with a houseboat, otherwise they must be returned the same day prior to 1/2 hour before the marina closes. Watercraft will not be rented daily after 2:00pm.